In search of his record fifth green jacket, Jack Nicklaus outdueled Johnny Miller and Tom Weiskopf in a final round for the ages. Bobby Nichols shot a 67 to take the lead after the first round at Augusta with Jack Nicklaus a stroke back followed by – guess who? – Arnold Palmer with a 69. A second-round 67 gave Nicklaus a five-stroke lead over Billy Casper, Tom Watson and Palmer. 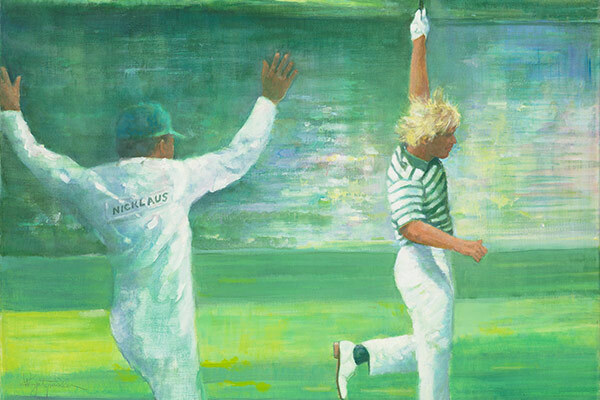 In a dream pairing, Nicklaus and Palmer played together in the third round. But as they were known to do over the years, the two found themselves playing each other rather than the golf course, and neither played particularly well. Meanwhile Miller scorched the front nine with a tournament-record 30 and a 65 for his round. Paired with Watson and battling Miller and Weiskopf in what Nicklaus later called the best down-the-stretch duel of his career, the golden bear made one of the most dramatic putts in major championship history when he ran in a 40-footer for birdie on the par-3 16th hole. He then held on for a one-stroke victory as Miller closed with a 66 and his consolation was a tournament record for the final 36 holes. For Weiskopf, it was his fourth runner-up finish.